Enzo Life Sciences continues to expand its offering of unique target ELISA products with the introduction of the PEGylated Protein ELISA kit. The sensitive PEGylated Protein ELISA kit allows for quantitative detection of a diverse set of PEGylated molecules in plasma, serum, tissue and other biological samples using a competitive ELISA format. The kit is applicable for drug development and pharmaceutical manufacturing applications including drug formulations, pharmacokinetics analysis, drug comparison, lead candidate identification, lot release criteria and in-process QC studies. The kit has also been validated for quantification of PEGylated target molecules in complex biological matrices, extending its utility for monitoring drug levels or its accumulation in tissue. 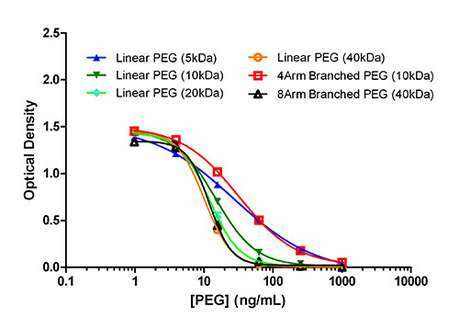 The assay measures <1ng/ml of PEGylated molecules and is validated for a wide range of molecular weight linear and branched PEGs, both in free form and as protein conjugates. With the ability to analyze up to 35 samples in duplicate in just 2 hours, the kit is fit for rapid, high throughput analysis. Like all Enzo Life Sciences ELISA kits, the PEGylated ELISA kit is complete, flexible and thoroughly validated. It is supplied with an easy-to-follow protocol, pre-coated microtiter plate and liquid color-coded reagents to save the user time and reduce errors. The break-a-part strip plate design provides flexibility – not having to run all 96-wells at once. The kit is put through rigorous fit-for-purpose validation and stability testing to ensure high precision, accuracy, sensitivity, and specificity. The PEGylated Protein ELISA kit is the most recent addition to the Enzo portfolio of products for bioprocessing research. Other highlight products in this portfolio include the ProteoStat® dye-based assays for detection of protein aggregates, and a Protein A ELISA kit for residual contaminant detection. For more information on, or to order the PEGylated ELISA Kit or other Enzo Life Sciences products, please visit us at www.enzolifesciences.com or call us at 1-800-942-0430. Enzo Life Sciences, Inc. is a recognized leader in labeling and detection technologies across research and diagnostic markets. Our strong portfolio of kits, libraries, proteins, antibodies, peptides, and small molecules, provides life science researchers tools for target identification/validation, drug discovery, high content analysis, gene expression analysis, nucleic acid detection, protein biochemistry and detection, and cellular analysis.